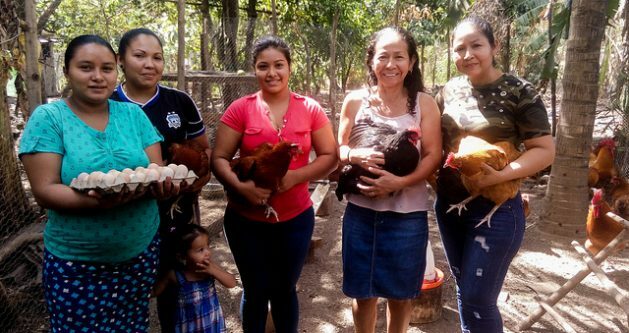 Feb 08 (IPS) - Salvadoran farmer Lorena Mejía opens an incubator and monitors the temperature of the eggs, which will soon provide her with more birds and eggs as the chickens hatch and grow up. Mejía is one of the beneficiaries of a project that seeks to offer productive ventures to women who, like her, have been deported from Mexico or the United States while they were attempting to achieve "the American dream." "I left because I worked in a factory in San Salvador, but the money wasn't enough," the 43-year-old woman told IPS in the yard of her home in the village of Talpetate, Berlin municipality in the eastern Salvadoran department of Usulután. "Now I'm focused, together with my colleagues, on making this project grow," she said. In spite of the importance of the support from Centa and FAO for the women's organisation, the Salvadoran State has not yet developed a strategy aimed at the economic reinsertion of returning migrants, and in particular women. "Sometimes what you need is a little boost," said Mejia. "Rural women are the motors of the economy, and at FAO we support returnees through inclusive and equitable processes," Emilia González, the U.N. organisation's assistant representative for programmes in El Salvador, told IPS. "We saved the money we would use to buy a few pounds of chicken," Marlene Mejía, 46, another of the beneficiaries, told IPS. "If you have a job here, why suffer over there?" she asked. The Salvadoran government offers some support for the economic reinsertion of returnees, through the project called "El Salvador is your home", launched in October 2017. But these are derisory amounts in terms of the number of beneficiaries, given the magnitude of the deportations and the country's economic problems, so that most returnees find no economic stability, and government assistance falls far short. "Evidently it is insufficient; a bigger effort is needed to be able to offer options to people when they return to their hometowns," Jaime Rivas, a migration researcher at Don Bosco University, told IPS. The last time, in 2015, he managed to reach the outskirts of San Antonio, Texas, but the group of migrants with whom he had been crossing the desert for seven days was intercepted by the "migra", as migrants popularly call agents of the U.S. Immigration and Customs Enforcement. "I spent the whole night hugging the scrub to hide from a helicopter with a searchlight, which was looking for me," he told IPS. He also employs a dozen young people as pickers, and feels he's preventing youngsters from risking their lives crossing deserts to get to the United States. "I don't pay them much, just five dollars a day, but if I had more support, I could employ more people," he said.